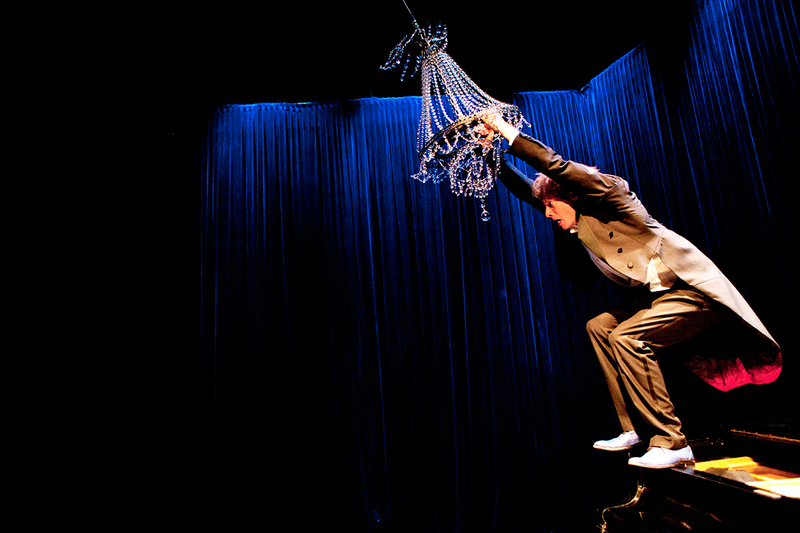 As Thomas Monckton swung off his piano holding onto a chandelier, peals of laughter bounced all around the theatre. This climactic moment is just another hilarious stunt in a show full of silliness and slapstick. Reminiscent of Mr. Bean’s mute brand of misadventure and physical humour, Monckton plays a pianist whose performance goes awry in every possible way. The children in the audience sure had fun as Monckton struggled to get onstage and sit down at the piano without any mishaps, but he couldn’t even get through the curtain. Once he managed to fit himself through a small hole in the curtain, he hit his head on the chandelier, dropped his sheet music, and slipped on the piano cover. And that’s only in the first few minutes. One of the funniest mishaps was the leg of the piano falling off and Monckton struggling to hold up the piano as he searched for a solution. A simple gesture, a quizzical look, and a sly nod to the audience is all it takes to turn a mundane action into a hilarious farce. The show is short and sweet at just under an hour, and Monckton’s facial expressions and precise gestures keep things moving at a good pace. I don’t think the show could be much longer without getting repetitive; it seems to me the concept has been taken to its fullest realization and the pacing and comedic timing are exactly right. Just when you think he may finally be able to sit down and play the piano, something else goes wrong and he’s set back again. When we do finally get to hear Monckton play, it’s a beautiful calming tune that almost acts as a lullaby to send us home, ending the catastrophic show on a calm note.